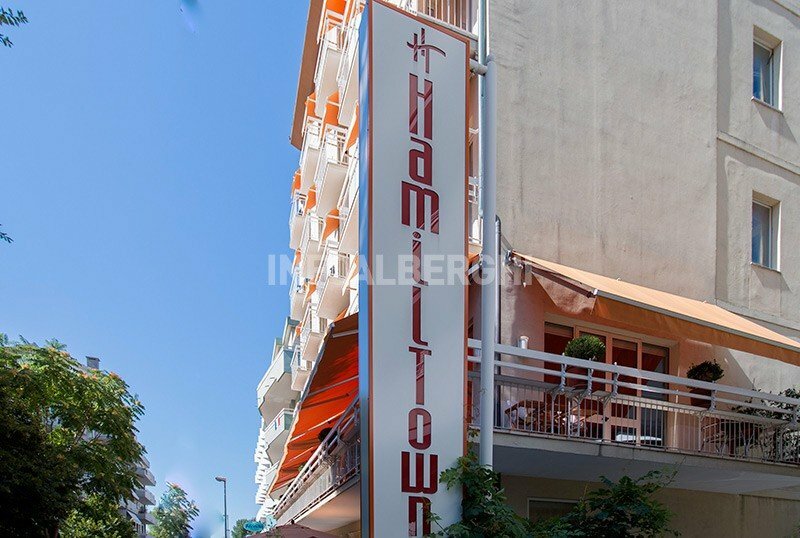 HamilTown Bijou Hotel is the first Italian Bijou Hotel, with special atmospheres and tailor-made for couples, young people, families, ideal for those traveling for vacation or business. It has WI-FI, parking, services for children. Accepts small and medium-sized pets. The hotel is located in Cattolica, a couple of minutes walk from the beach. The location is convenient for those who want to reach the Aquarium of Cattolica, which is about 300 meters. The HamilTown Hotel has 40 rooms and suites. All rooms are furnished in a modern and well-kept, soundproofed and equipped with individually controlled air conditioning, WI-FI, Sky TV. On request, they can be equipped with services for children. MIGNON: these are small rooms (from 14 to 16 square meters) suitable for two people. BIJOU: solutions of about 18/19 square meters suitable to accommodate couples with a child. They have a balcony with a side sea view. SHARKY BIJOU: arranged on a marine theme and inspired by Sharky shark, they are spacious, with a balcony with side sea view and can accommodate two adults with two children aged between 3 and 6 years. CHARME: are spacious bedrooms (21 sqm) ideal for couples and families. SHARKY COMMUNICANTS: large rooms (30 square meters ) characterized by decorations that reproduce the marine habitat. Composed of two bedrooms and two bathrooms, these rooms are suitable for up to two adults and three children. SUITES: solutions composed of two connecting rooms, one with king size beds and the other for children connected to the main one by a sliding door. MIGNON COMMUNICANTS: two connecting double rooms complete with double bathrooms, for a total space of about 30 square meters. BIJOU COMMUNICANTS: two connecting double rooms with double bathrooms characterized by the presence of large spaces (38 sqm). The hotel, refined in its furnishings, on each floor boasts sculptures and contemporary paintings. It has a terrace, free bicycles, lift, reading room, welcome drink, theme nights. On request: laundry service, beach towel and newspapers. It organizes theme nights, offers the possibility of daily refilling of the in-room fridge and an open coffee bar. PARKING: 24- hour covered and guarded parking with free shuttle and private garage. Both available on request. CONVENTIONS: beach, restaurants, amusement parks and discos. PETS: the hotel welcomes pets of small and medium size with drinks and welcome gadgets, rooms with parquet and balcony (when available), mat for rest and bowls for water and food. The 4-legged friends stay free and are just a few meters away from a veterinary clinic. BREAKFAST: international and Italian buffet, available from 7 to 14 every day. LUNCH AND DINNER: the restaurant opens only for weddings or special events. In hotel: baby / mini / junior club with outdoor and indoor playground area, nursery 0-2 years, Playstation 4 and Wii, bicycles with seat, strollers available and parking strollers, agreements with the main amusement parks of the Riviera and possibility of buy tickets directly at the hotel. Finally the mascot Hamil will wish the little ones good appetite every Sunday evening. On request: baby sitter and pediatrician. In the room: cribs, changing table, anti-fall rails, baby bath tub, clothes rack, bottle warmer, toilet reducer, stool to reach the sink. The staff is available to meet any further need. On the beach: mini club and baby club, creative workshops, heated salt water pool with slide and water games, day and evening entertainment, baby dance, fashion shows and shows, playground and gazebos. The hotel has an agreement with the beach n. 105 Alta Marea Beach Village, with swimming pool, gym, hydromassage, playground, mini club and entertainment.